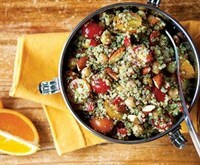 Combine quinoa and water in medium-sized pot. Bring to a boil, reduce heat, and let simmer until water is absorbed, about 15 minutes. Remove from heat, fluff with fork, and set aside to cool. Meanwhile, whisk olive oil and cider. When quinoa has cooled completely, add cider and oil mixture to quinoa and gently combine until the dressing is evenly distributed. Add remaining ingredients and toss to combine. Split among 4 bowls and serve, or among 4 airtight containers and refrigerate. Notes: Don’t have all the ingredients? Don’t worry! Diced and seeded cucumber, bell pepper, chopped spinach, and red onion would all work beautifully in this dish. Just use your imagination and any left overs! Swap out the cider vinegar and oil for pesto for a different twist. The sky is the limit.